People use “bomb-proof” to describe lots of things that really aren’t. Applying that same description to Bessey Industrial-Grade Vises is far more appropriate. Vises aren’t regarded as high tech even though the design of the iron and manufacturing processes used to make the better ones that tough are far more sophisticated than we might expect. More apparent is that these vises will easily maintain their form and function for the rest of our lives, our children’s lives and then some. Bessey designs these vises to be a one-time investment for most of us that probably costs far less initially than you might expect. In this review we look at three of the top sellers from Besseys’ line of industrial vises. It is worthwhile to remember that Bessey is known world-wide for designing and manufacturing some of the toughest metals available. They have the industry horsepower to apply that kind of in-house capability towards producing products others can’t match at any price. This may be the smaller of the three vises here but it is made using the same high end materials and manufacturing priocesses as the rest. While it is the smallest in this group of vises the BV-HD40 still features a 4”-wide jaw, 4” opening capacity and a 2” throat. For many home and small shop operations that exceeds your day to day needs. Made from super-tough gray cast iron with a 30000 psi tensile strength you get a toughness that lasts a lifetime. The BV-HD40 features a 360 degree swivel base, 2 lockdown handles and 3 mounting holes to secure it to a suitable bench. It has replaceable jaw inserts that are crosshatched to give them a better grip on the material being worked on. It also sports a large cast-in anvil surface just behind the rear jaw. Known also as a machinist vise the 6" jaw is very popular from industry to the home shop. If you want a brutally tough vise for general shop work, this has to be the one. 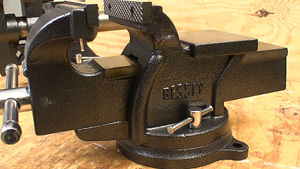 Also made from 30,000 PSI gray cast iron the BV-HD60 just uses more of it to insure durability in the tough environment in which this vise is expected to function. It has 6”-wide jaws, a 6” opening and a deep, 3” throat depth. The jaws have replaceable inserts with cross hatching to enhance their grip. This style of vise uses an Acme-threaded shaft to make applying pressure fast and easy. It also resists contamination well to keep on working easily. This vise also has a 360 degree swivel base with two lockdown levers and 3 mounting holes so it can be secured to your bench. It also features a large, built-in anvil just behind the rear jaw. This vise brings two different jaw designs for the shop that never knows what is coming up. It is tough, powerful and uniquely configurable to put the work where you need it for efficiency or safety. When your workload is equal parts tough and varied the BV-MPV5 could be just what your shop needs. 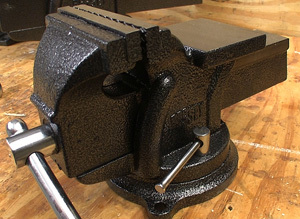 It also is made from the gray cast iron with a 30000 psi tensile strength but features two jaw designs in one vise. 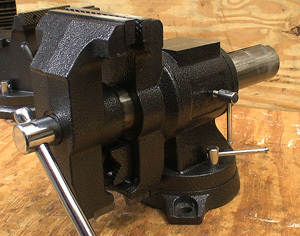 The head of this vise is mounted on a round shaft that can be rotated as needed to put the work at the best angle and locked in place. One side has a traditional jaw design that is 5”-wide with a 5” opening and 3” throat depth. These jaws feature replaceable cross hatched inserts. When your work turns to pipe or other round sock you can flip the jaws over using a single locking lever and bring up the pipe jaws that can handle stock up to 2”-diameter. The top of the jaws have V-shaped inserts that let you grip many odd-shaped objects. The BV-MPV5 has a 360-degree swivel base with 2 lockdown levers and 3 mounting holes for fasteners. It also features a large built-in anvil for when you need that. I have had all of these vises in my shop and frankly can’t see how any reasonable person would need to buy more than one in a lifetime, unless you wanted more than one design. There is nothing except the sure-tough jaw inserts that even might need to be changed out at some point and I really doubt any of us can wear them out either. While vises are not cutting edge technology Bessey puts a lot of manufacturing know-how into the metals used as well as the manufacturing processes that produce cleanly made, overly tough tools that make any type of shop more efficient. NewMetalwork.com viewers are not likely to be owners of industrial organizations but I can promise that we can be every bit as tough on a vise as the next person. If you look at the links by each of these vises the pricing should be a pleasant surprise. These Bessey vises are true industrial quality at DIY prices. If that doesn’t make good fiscal sense to you I just can’t help.